We’re currently parallel parked in Parallel Time, a nearby exospace where everything is basically the same as our world except that I’m entirely sick of it. Barnabas and Julia have travelled on purpose to this strange otherworld in order to save the concurrent Collins clan from soap vixen succubus Angelique, a freeze-dried ice witch who’s come back to life thanks to a proprietary formula that nobody quite understands. Angelique’s father, an underqualified humbug named Timothy Stokes, has resurrected his beloved daughter using some fateful combination of medical science and black magic that he can’t really explain, because he is neither a doctor nor a magician. I’m not sure what he is; he seems like a grifter who hangs around the dog track. But he has successfully rebirthed his wicked stepdaughter, using syringes, black candles, a nameless female houseguest on semi-permanent sleepover duty, and maybe a couple rolls of masking tape. There must be a trick to it, that’s all I can figure. So there’s this young woman over at Stokes’ place who’s lying face up on a table, unable to move or speak or eat or do much of anything, except send her life force to Angelique via the candles. If Barnabas and Julia can get her to wake up and take charge of her life force again, then Angelique would fall on the floor and die, which would be great, because then we could go home and play with our own Stokes, who drinks sherry and makes fun of people. But here’s the complicated part. Quentin is currently on the run from the police, accused of choking lunatic pianist Bruno Hess to death, which he didn’t exactly do. I mean, Quentin choked Bruno — he chokes a lot of people — but he didn’t actually choke him all the way to death. Quentin got him maybe two-thirds of the way, and then Angelique did the rest. It’s a fraught scenario, and it’s hard for me to explain it to people, because in every single episode, they make an unexpected tweak to the audience’s mental model of what’s going on. I’m not talking about a plot development, which would be nice; I’m talking about the main characters taking a slightly different angle on what they think the story is about. For example: this “control her condition slightly” business, which is a whole new idea. A couple days ago, Barnabas and Julia wanted to wake Roxanne up, because then Angelique would die and everyone would be happy. But now, they’re concerned that if Angelique dies, they’ll never be able to prove that she killed Bruno, although I’m not sure how they’re going to prove that anyway. So suddenly Barnabas wants to try this weird time-share concept where they weaken Angelique by a certain percentage, just long enough to secure a murder conviction. So there you go, apparently everybody’s a sorceror supreme today. Y’all need to step back for a minute and figure out your areas of expertise. But if there’s one thing that Barnabas knows how to do, it’s break into a place and fool around with unconscious young women. That is actually a Barnabas Collins specialty. 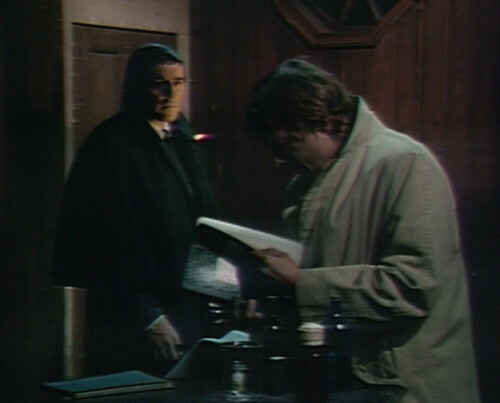 And what do you know, it turns out Stokes doesn’t even lock the door; Barnabas just turns the handle, and walks right in. Then they make their way through the drawing room, and the door to the mad science lab is unlocked too. And there’s Roxanne, or some Roxanne-shaped object, lying face up on the table. Now, between you and me, that’s not actually Roxanne under the sheet, because they didn’t need the actress to show up today. All she does is lie there until Barnabas and Will load her into the car, and then she still just lies there, somewhere else. This is not actually a story about Roxanne. Roxanne is a MacGuffin, an object with no inherent value that motivates the characters in a story to make decisions and take action, like the Maltese Falcon, or the blueprints to the Death Star. You could replace her with a mannequin, as they do today, and it doesn’t make any difference. The only thing that matters is that she’s the key to destroying Angelique. Roxanne is basically an off switch that Barnabas inexplicably falls in love with. Now, the mechanics of the kidnapping are a bit hazy. 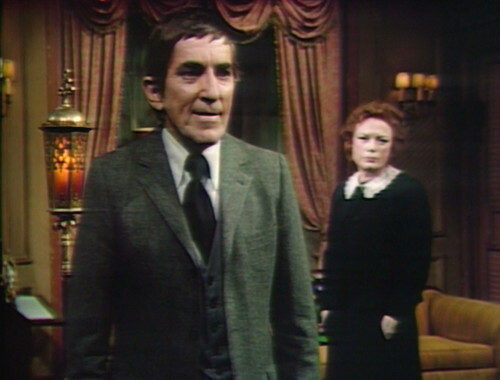 Barnabas mentions that they’ve got a car waiting outside, and they’ll have to carry her, which is easy to say. Have you ever carried an unconscious person out to your car? It’s not easy. There are a lot of doors between here and the Old House, and somebody has to hold them open. Grown humans just aren’t that portable. But Barnabas doesn’t give it a second thought, he just leans over like he’s going to pick her up and carry her under his arm. He’s about to learn some important lessons about anatomy. 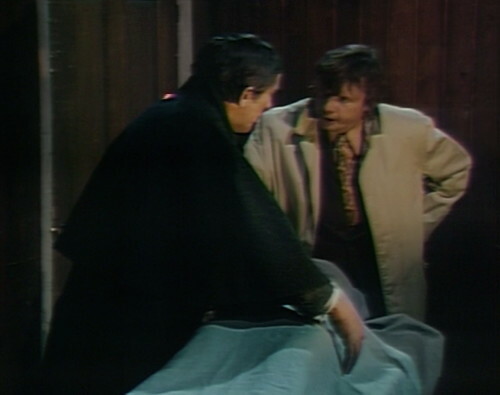 But this kind of thing happens all the time on Dark Shadows; they’re always moving a coffin from one location to another, sometimes single-handedly, through a series of secret tunnels. We don’t see it happen, of course; they just say, “Let’s move this coffin,” and then the next thing you know, it’s somewhere else, like they beamed it up to the Enterprise. This is one of those. But there’s a moment in the middle of this heist sequence that we have to discuss, because it’s jaw-droppingly odd. I know we’re all busy these days, but take a moment to appreciate that line. I don’t even think that’s Fridspeak, that’s actually a line in a script that was broadcast on television. See if he has any records on her? And then Will, bless his heart, walks over to the notebooks. He picks up two of them, flips through them for literally four seconds each, and then slams them down on the table, yelling, “Barnabas, we’ve been here too long!” So that’s the end of that research project. And then, ta-dah! The next thing you know, she’s all the way in the secret room behind the bookcase in the Old House, presumably none the worse for wear. This tiny crawlspace is where Barnabas stores the coffin that he sleeps in, except if they have a scene where they need something else to be there, which is most of the time. 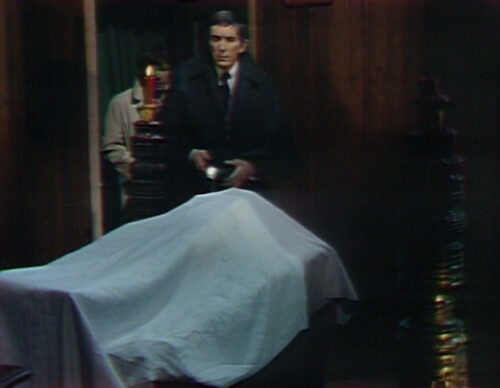 So I guess they’ve teleported the coffin into self-storage, and Barnabas has lined up an AirBnB somewhere. Now, obviously, I don’t expect gritty realism in my psychedelic supernatural science-fiction comedy soap opera, so all of this warping of time and space is fine. This is fairy-tale plot construction, where the handsome prince is a vampire, and if he can awaken Snow White with true love’s kiss, then the mean witch will die, and the dwarfs can all go home to their own dimension. Naturally, Angelique shows up looking for Barnabas, so Will has to go out in front of the bookcase and pretend that Barnabas got called away unexpectedly. She says that she’ll wait, so he makes a big deal about how he’s decided to stop drinking and start writing again, and he’s just about to start his new best-selling novel. But it’s actually not clear why they have to hide Roxanne from Angelique, because what would she do if she knew they had her? She can’t drag Roxanne away by herself — there’s three of them and only one of her, and she doesn’t even have a car outside. And you can’t call the police, and report that somebody stole the unconscious life-force donor from the back room at your dad’s house. This is an area where the police can’t really help you. You are no longer part of their customer base. And then, just when they’ve got that scenario under control and you think you understand what’s happening, they make another unexpected change in story direction. Will says, “That’s impossible,” but nothing is impossible for Fridspeak. So that’s got to be the third bank turn in story-progression this week. We started the day with the idea that we were going to steal Roxanne and partially revive her. Now the problem is that we need to prove to Quentin that Alexis is Angelique, and somehow showing him Roxanne is going to help. I mean, telling Quentin the truth about Angelique would be a perfectly understandable narrative goal, but it’s not the one that we’re currently aiming at. If they wanted to do that, they would have done it by now. This is the one time in the last several months when convincing Quentin that Alexis is Angelique would not actually help in any way. So what we’ve got here is a herd of Schrodinger’s cats. Angelique is both alive and dead at the same time, and Roxanne is too, from the other direction. It’s no wonder the Fridspeak is flaring up. Barnabas is straddling two worlds, with one foot in “Quentin needs help” and the other in a parallel dimension called “Angelique is helping him.” He can’t actually make progress, because every time they establish what his goal is, they shake up the Etch A Sketch and start over. Maybe Will could check the notebooks again? I’m sorry, I’m just trying to help. Will is shocked when he sees a purple drape hanging up at Stokes’ place. Barnabas takes it down, says “Will, it’s nothing,” and tosses it on a chair. What is that, and why did Will (and the music cue) find it so alarming? When Amy runs into the drawing room in act 1, there’s a boom mic visible at the top left. On the plus side, Lara Parker looks really good in this episode. I don’t have much else. She’s gorgeous but I still wish they’d have let her wear her hair down during modern era “time bands.” She would have seemed so much younger – and sexier. When did she let her hair down? Leviathan Era? I guess I’m thinking about her hairstyle in the DS box set interviews. Also, she wore her hair down in that movie she made with Peter Fonda, Race with the Devil. The French twist is very classy but, Angelique would have looked smashing with an updated 70’s look. That swept up and sprayed hair makes her seem too old for Quentin. That’s OK. Barnabas is one of those vampires who have super-strength. Have you seen him strangling someone? He just puts one hand up to their throat and about 2 seconds later, they’re through. Which kind of begs the question about Barnabas being able to pull off anything that ought to be done. He has enormous power, but uses it inconsistently. When he first arrives at Collinwood in 1967, Mrs. Johnson invites him in. He was also invited into the Evans cottage. Yeah, it’s totally inconsistent. It would’ve been great if they’d used this one consistently, so it was an annoyance to him. Like when he was a vampire he had the super-strength, but was disadvantaged in that way when he wasn’t a vampire. And if it was really obvious. But they didn’t even manage to make him super-strong as a vampire consistently. They make him normal-strength whenever it is convenient to the plot. Barneys! I love it. Hilarious. 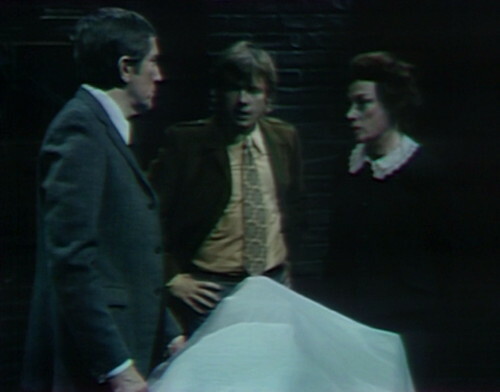 Danny, do you think that perhaps Will thought the purple drape might have been Hoffmann’s ghost, since he and Barnabas had encountered it the last time before at Stokes’place? 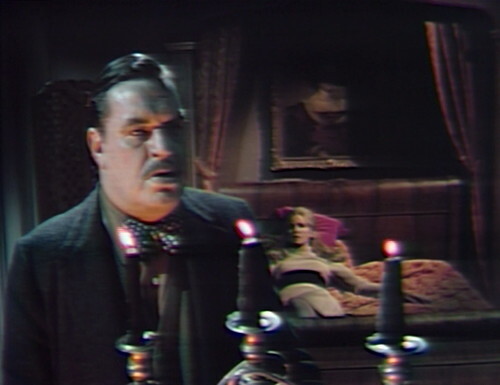 I think it is supposed to be that Will thinks he is seeing a ghostly figure (given ghost-Hoffman’s voice), but it turns out just to be a purple cloth hanging there. Ha! My page didn’t update before posting this, to see that someone had just said the same thing. I always get a chuckle watching Barnabas claim that “I’ve had work transferring life force into Adam” makes him an expert. That’s like saying some who had bypass surgery can perform open heart surgery. He really shouldn’t bring up the Adam experiment anyway because it was basically a flop and the “Bride of Adam” was an unmitigated disaster. In fact DS is a chronicle of failed experiments and medical treatments, magic spells gone awry, unintended results from dabbling in the supernatural arts, etc. Not sure I agree that Roxanne was intended as a maguffin. Like Amanda Harris she was introduced as new love interest for the “hero” toward the end of a storyline. But expediting the plot meant Roxanne got even less time to flesh out her character. More on her later. I agree. I don’t think they could have imagined people in 2017 dissecting these episodes…which, when you think about it, is somewhat hilarious. I have read references to fan fiction wars between different characters of the show. I had NO earthly idea. I am actually still in the 400 episodes of this blog with time-traveling girl governess Victoria Winters but every now and again I get sucked into a new post by a first line or a quote from Danny or I think about the writers and producers of the episode. I was actually ALIVE when this show was on and thinking my friends had lost their minds running home from school to watch it and I heard all about Quentin and Angelique until I was ready to scream (and the songs were on the radio!). I turned OFF to everything DS with this incessant chatter about it. Now, I’m fascinated. I started watching it LAST FALL (only 50 years late…who’s in a hurry?) and still haven’t sorted it all out for myself so I have no idea what a post like this is even about or who are all these people. 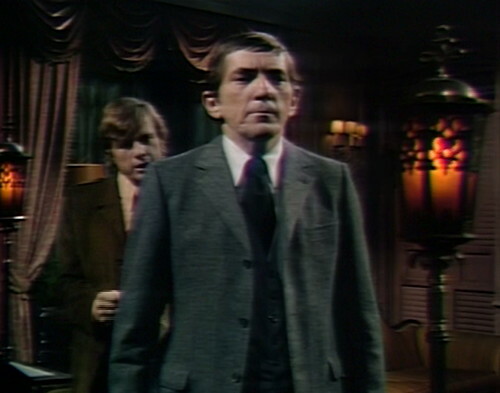 Last fall, I was googling Dark Shadows because the sci fi channel started on some random episode and I wanted to see what I’d missed when I fell upon this blog and have been SLOWLY reading and savoring ever since. I commute into and out of NYC and sometimes this blog is the only thing that keeps me from murdering someone on the MetroNorth. (thanks Danny!) Though I have laughed out loud on the Quiet Car and that is frowned upon. But I thought I’d pop into the latest blog and say hello, even though I have no clue what is going on. Back to 1795 now. One day I’ll catch up…. There’s a big buildup to Claude North and he appears only in a few episodes before he is gone. It’s just occurred to me that no dogs have been heard to howl in PT Collinsport. Whenever Barnabas sets his mind on a sudden new romantic interest, or is set to do something decisive, you would always hear the dogs howl, but apparently not here in PT. Sorry, guess there are no dogs or canines of any kind in PT…instead, badgers and giant voles are kept as house pets. Not to mention the tame pigweasels. David and Amy had a house-trained little cutie named John Wellington Wells, but the little dickens mistook the Ralston+Purina lamp for a container of Purina Pigweasel Chow and got the shock of his life. One more way that PT Collinwood is a less spooky. Can anyone guess what the line above was supposed to be? Would it track if we corrected for Fridspeak? Honest question. I think they’re trying supernatural blackmail. If they can figure out a way to bring the girl under the sheet back to the state where her eyes were open and she seemingly was conscious, that will weaken Angelique. And they might be able to manipulate Angelique and.or keep her from any more dirty work as they try and prove Quentin’s assumed innocence. I did a lot of speed in college (more than three decades ago) and it just reminds me of what happens when you write yourself into a corner and hope the actor can give it a convincing thrust… and then the actor blows it and half a century later Danny Horn does the final alchemical spin into Theatre of the Absurd. My guess is that the first “control” shouldn’t be there – perhaps it was supposed to be “alter” or “change” or something like that. But when he went on to the second part of the statement, he realised he was screwed so started stammering. Alice felt dreadfully puzzled. The Hatter’s remark seemed to have no sort of meaning in it, yet it was certainly English. I love the part where Will is telling Angelique that he thinks Barnabas might have a girl somewhere and that he’s very secretive, then they cut to Barnabas and Julia listening and Julia seems to think that is highly amusing. I swear it is Grayson Hall having a chuckle, not just Julia. Coffins in Collinsport are easy to carry because they’re made of balsa wood. That’s the only explanation for how easily zombies are able to stick their hands up out of the grave right through the coffin lid and intervening layer of earth. Maybe it’s the mustache, but to my eyes PT Stokes has a stronger resemblance to Sandor than to RT Stokes.